Aperitivo a base di prosecco selezione Fuzion , basilico thailandese e sciroppo di sambuco servito con noccioline ricoperte di spezie orientali . CUCINA DI QUALITÀ - Il ristorante Funzion Unconventional Food sorge a Torino, nei pressi di Piazza Lagrange. Come è facilmente intuibile dal nome del locale, la proposta culinaria è ricca di specialità mediterranee rivisitate, preparate e presentate in modo innovativo. CORDIALITÀ - La struttura è raccolta e molto accogliente. Si tratta di un luogo perfetto dove trascorrere serata tra amici ed in famiglia. Surprisingly delicious! Eventhough I’m not familiar with the menu. Maybe the owner can put some photos of the menu to make it clear and more interesting. I ordered takoyaki with pesto, sushi shrimp and chicken, wagyu burger and classic rice burger. All delicious! Best pizza in Turin, possibly the world?!? Very nice staff and atmosphere. It had a cool, jazzy vibe. Very relaxing. The dishes were suprising and delicious. Fully recomended! These guys put passion and effort in their cuisine - they aim to revisit the traditional Piedmontese (and more generally italian) culinary tradition with a modern and creative touch. 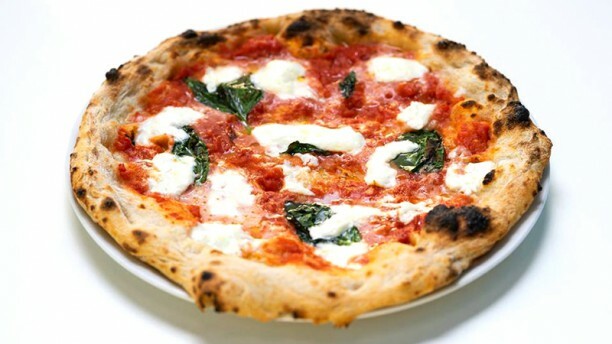 Very good pizzas, the dough is light and tasty, made of a blend of well studied traditional and niche flours. Interesting Italian “sushi” choice, I had rice rolls with raw meat sausage and Alpine soft cheese. Acceptable price range; the owner did not refrain from explaining each dish and how they built up their recipes and choice of ingredients. There is serious work behind and I appreciate their efforts. The food was creative while good. We especially liked the sushi, very delicious Korean spicy sauce! Ottimi ingredienti, personale gentile. Ci ritornerò. Amazing food and great people. Best place in the city to enjoy takoyaki. Si conferma sempre il top! Great food! They have both classic and fusion styles and they’re both killing it! Their pizza has this special extra-light crust that makes it special. Calabrese roll is a wild mix of flavors that work amazingky well together or one by one, specially with a tiny drop of soja sauce! Great service with a multilingual staff that is always there to explain everything! As an innovative-cuisine lover I'm a bit disappointed. The style of the restaurant is more like a fast food/Pizzeria with Asian food ingredients added. The guests who were talking loud and chewing loudly with mouth open also negatively effected my dining experience. It's more suitable to be catalogazed under fast food/take out spot rather than innovative cuisine, it sets the wrong expectation for gastronomy - ethusiast like myself. Service was courteous. Lovely innovative tasty food. A must for anyone visiting Turin!